The fourth Handmade Collective event in Bangalore will showcase crafts by communities across India. This year The Handmade Collective is all about communities and their efforts to revive dying art forms, says Mala Dhawan, co-founder of A Hundred Hands, the non-profit trust that has been organizing the event in Bangalore since 2009. The focus this year is on community crafts, the communities that create them and the communities that are sustained by them. “More than 60% of the work on display by the 65 artists will be community-based,” says Dhawan, adding that the four-day event, which starts on Wednesday, will not only be about the sale of these works, but will also have live demonstrations of the making of arts and craftworks. You can expect to find garments and accessories, home and garden-ware, traditional toys, gifts and home-made food from across the country. Art and craft forms on display include traditional arts like Warli, Sanjhi, Mughal Phad, Pattachitra, Madhubani and Gond and a variety of traditional work on contemporary products. Stree Shakti Purkal“The idea is to allow these communities to have dialogues,” says Dhawan while talking about the work done by the villagers displaced from the Ranthambhor National Park in Rajasthan. Carpets made with kilim hand-knotting technique, revived by a community of carpet weavers from Mirzapur (Uttar Pradesh), and products made by Uttarakhand-based self-help group Purkal Stree Shakti Samiti, which works on patchwork quilts, will also be on sale. Keeping with the theme of community, A Hundred Hands initiated an international project in August requesting knitters, quilters and those who crochet to send in four-square-inch and eight-square-inch pieces to help make blankets and quilts. These will be donated to hospitals in Bangalore. Some of these blankets will be on display at the collective. There will be an installation competition in which craftspersons, artists and communities will build installations on a socially relevant issue using scrap. 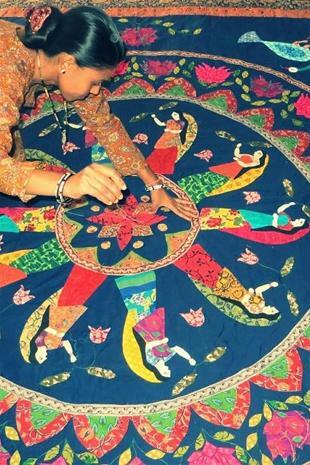 There will also be a workshop to teach children about Madhubani motifs and the stories behind them.